Karen Irving is a self-taught artist who was born in Halifax, Nova Scotia and now resides in the downtown Eastside of Vancouver, British Columbia. She has been painting since 2005, and became a full-time artist in 2014. As a young person, singing, playing the guitar, and fashion was at the forefront of everyday life. While working on a cruise line in the Caribbean she developed a love of rich vibrant colors like the reds, oranges, and yellows that came to influence her work. In 1998 she moved to Vancouver to find work in human resources/training & development in healthcare. 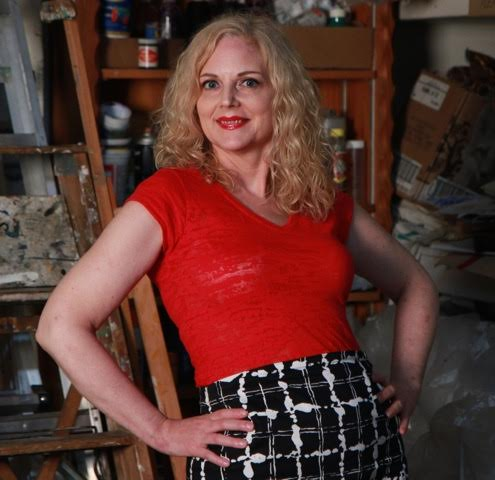 Her passion for art started after she contracted bacterial meningitis in 2004 and almost died. Karen’s doctor recommended painting her thoughts and feelings on canvas. She then started to become inspired by a new spiritual energy and the world around her began to open up as painting became her one and only passion. She paints not for the business side of the craft, but for a sense of being one with the art. Pure bliss of happiness and harmony – coming together as one mind, body and soul. Her art is about transformation and movement; a living testament of blending textures, layers, shading and contrasts. It traverses on an individual, unique, and hidden journey of bold and vibrant colours with dancing texture and mysterious images. Karen’s work is alive. It draws you in with a seductive sublimity of movement and transcends the imagination and soul. Karen is a Collective Member and Board Member at large at the Gallery Gachet in Vancouver BC. She showed at the 2016 Downtown Cultural Crawl held at the Kettle Friendship Society.